UPDATE: Jan. 4, 2018 — On Nov. 29, 2017, the Federal District Court of Maryland approved a consent decree that resolves the Environmental Protection Agency's clean-up requirements, as well as claims for natural damages at the 68th Street Dump Superfund site in Baltimore, Maryland. use settlement funds to restore the public’s injured or lost natural resources — for more information on the restoration projects visit the Damage Assessment, Remediation, and Restoration Program's story. March 16, 2017 - Baltimore can be defined as much by its waterways as its skyscrapers. It’s connected to water through the Inner Harbor, its famous crab cakes, cargo and cruise ships, and its prominent location in the Chesapeake Bay. West of the city, well-preserved Patapsco Valley State Park extends along 32 miles of the Patapsco River, encompassing 16,043 acres and eight developed recreational areas. Now, in nearby Rosedale, there is an exciting project to reclaim hundreds of acres of a special coastal area formerly used as an urban industrial wasteland. The 68th Street Dump Site is a 239-acre swath of land, 118 acres of which was once the site of seven landfills, where industrial solvents, paints, and automobile tires were among the polluting substances left behind. The landfills operated from the 1950s to the early 1970s before closing and leaving behind toxic waste. The Environmental Protection Agency designated the area a Superfund site in 2000. In the summer of 2008, EPA removed contaminated surface soils, containers, gas cylinders, empty drums, and batteries from the site. The actions immediately reduced the human health and ecological risks posed by surface contamination and debris to on-site workers, trespassers, and wildlife. 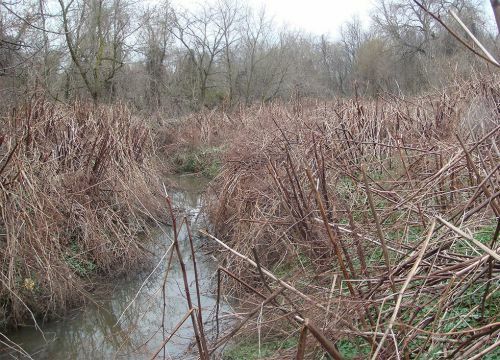 Despite the contamination and degraded state of the land, federal and state governments, as well as the local community, recognized the value in restoring the 118-acres because of its proximity to important local waterways. The 68th Street Dump site is adjacent to the Back River, with several tributaries, partially tidal, that traverse the site, including Herring Run, Redhouse Run, and Moores Run. The low salinity upper reaches of the Chesapeak Bay, like the Back River, are critical areas for a healthy bay, according to Simeon Hahn, regional resource coordinator with the Office of Response and Restoration in the Damage Assessment, Remediation, and Restoration Program. Areas with large population centers, like Baltimore, present even bigger problems than just cleaning up and restoring contaminated sites. Blighted areas like the 68th Street Dump can lead to higher crime rates, lower property values, weakened local economies, and deny the public access to natural areas. The National Oceanic and Atmospheric Administration, as well as its co-trustees — the Department of the Interior and the State of Maryland — have been involved in developing restoration projects to compensate for the natural resource injuries that occurred from hazardous substance releases at this site. NOAA, along with the U.S. Fish and Wildlife Service, the Maryland Department of Natural Resources, and EPA coordinated with the Urban Waters Federal Partnership on site cleanup, restoration, and reuse of the 68th Street area. 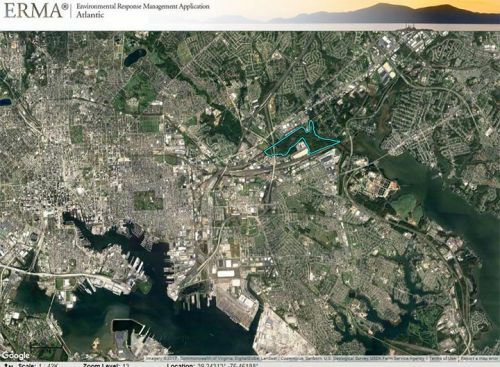 Reforestation, tidal wetland restoration, stream restoration, and potential public recreational access were incorporated into the cleanup plan for the site. ​ That will provide direct benefits to local water quality and contribute regionally to Chesapeake Bay restoration objectives. The Urban Water Federal partners work together in the same way other local organizations have invested in the 68th Street restoration. The Back River Restoration Committee has done a tremendous job of collecting the tons of trash that would enter the Bay from Herring Run, according to Hahn. “Without this effort, the trash would move down the Chesapeake and into the oceans and cause the numerous negative impacts plastics and other debris cause to aquatic life and even to humans,” Hahn said. NOAA worked with co-trustees and the responsible parties to include these activities in the cleanup and restoration plan. ERMA® is an online mapping tool that integrates both static and real-time data, such as Environmental Sensitivity Index maps, ship locations, weather, and ocean currents, in a centralized, easy-to-use format for environmental responders and decision makers. 68th Street Dump site was once the site of seven landfills. The blue outlined area shows the site. This aerial view was created using NOAA’s Environmental Response Management Application® (Credit NOAA).